This is a warm, pastorally hearted guide to the Bible's teaching on God's sovereignty. When a disaster happens; when personal tragedy strikes; when we are perplexed by world events, Christians can begin to doubt that God is either truly good, or truly in control. 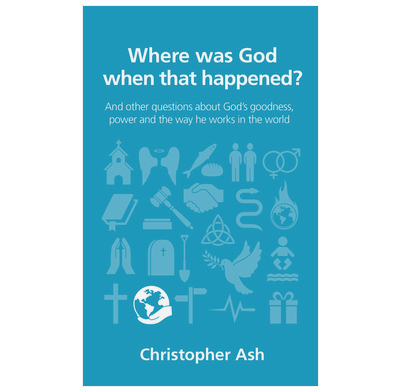 Christopher Ash faces these questions head on, without flinching at any of the difficulties. First he looks at six different ways people have answered this question — both as Christians and from other religions and none. He then reveals the Bible's answer: the revelation of God's character and purposes throughout history. Introduction: Is God Really in Control? Christopher Ash's book on God's sovereignty is exactly what readers of his books would expect: clear, succinct, and written with a charming simplicity that yet rests upon profound theology. Using examples from everyday pastoral ministry, he provides biblical answers to the kind of questions which all believers ask and also offers firm responses to the various common errors and mistakes which people make concerning such matters as God's providence, evil, and suffering. This is a great book to have on your church book table, to give away, and, of course, to read for yourself. Pastor, Cornerstone Presbyterian Church, and Paul Woolley Professor of Church History, Westminster Theological Seminary, PA.
Christopher Ash tackles with great clarity and sensitivity the toughest questions about suffering. Against views which try to derive comfort by denying God's existence or sovereignty, he shows that the only true comfort is in a thoroughly scriptural vision of who God is. This is a book which warms the heart and feeds the mind. If there is a God, how could he let (fill in the blank) happen? Whether we trust him or not, all people wonder how God runs the world. Once again, Christopher Ash writes with understanding while teaching us that there is a God, he is in control, intensely involved in every detail, and he is good. author of Housewife Theologian and Theological Fitness, cohost of The Mortification of Spin. "This is a little book that packs a big punch." This is a very good book and keeps to the subject matter throughout. A no nonsense book which covers the topic well yet very easy to read. Non academic or any preconceived ideas. Recommend it. This is possibly the clearest and most helpful book on suffering I've read. It doesn't shy away from the tough question of God's ultimate control over everything. Plus it's short- great for passing on and also for re-reading. I will definitely be buying this in bulk!